While college is a challenge for any student, the increased workload, complexity, freedom and competing demands make it particularly daunting for those students with Attention Deficit Disorder. But you need not be overwhelmed and you can succeed! College Confidence with ADD will help you turn obstacles into opportunities and overcome social, academic, financial, and personal challenges both in and out of the classroom. Whether your goal is to get into the school of your choice, improve your grades, survive the experience, gain guidance and direction, or springboard into the future of your dreams, this comprehensive and essential guide will help you succeed. 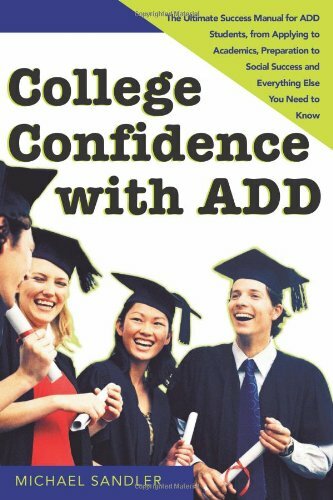 Set yourself up for success from day one with College Confidence with ADD! Michael Sandler is founder of The Creative Learning Institute and a practicing national ADD coach, author, and public speaker. He is a regular columnist for the national ADD magazine, ADDitude, and is a featured speaker at national ADD conventions. He lives in Boulder, Colorado.